Very interesting centre piece Plata Lappas Art Nouveau Excellent realization 38 cm x 20 cm x 12 cm THE COMPANY STORY Alcibiades Lappas founded the company in 1887. Since then, the company has grown and established itself as the leader in the business within Argentina. Its reach is not only local but international, exporting its style and designs worldwide. Plata Lappas is still today a family owned company, holding and honoring today the same values that were held by Alcibiades back in 1887. Alcibiades would be followed by his nephews and then by their son, preserving the values that gave rise to the company+ and avoiding the variations of an unexpected market economy. Today, the youngest generation has joined, for some years now, giving the company a new and global vision to face the future. The company's achievements throughout its century of experience have been extraordinary. Plata Lappas has had two different stores in Buenos Aires. One in the famous Florida street and was opened to the public for more than 60 years The Second one and most influential is the store located in the trendy neighborhood of Barrio Norte, Santa Fe Avenue. This neighborhood is today one of the most strategic and decorating circuits. With as little as 2 stores Plata Lappas has managed to position its products all over the world. This has been possible thanks to the excellence of the company products and the hard work of its employees. Plarta Lappas imprint can be seen around the globe. For example, Plata Lappas manufactures the silverware used in many of the most important weddings in countries like Bahrain and Saudi Arabia. Moreover, it provides its products to the traditional gift shops in England and Australia, where it is also chosen by recognized interior designers who look for quality and exclusivity in the products they select. Also, Plata Lappas exports to more than thirty countries, including Lebanon, Singapore, Switzerland, Liechtenstein, Monaco, Greece, Guatemala. Plata Lappas has a strategic office in Dallas from where it operates the US and Canadian markets. Renowned for its style, collections and the high quality of its products, Plata Lappas has been chosen by argentine people, generations after generations, as well as luxury hotels and embassies from outside the country, where Plata Lappas is invariably present through the metal and leather products that best represent us. Interesting old silver plated WMF cup Argentine ward 40 cm x 15 cm. Very interesting old WMF set of 6 tiny pan. 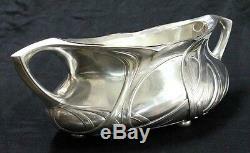 Lovely Art Nouveau Jugendstil Modern Style pair of silver plated WMF pitcher. 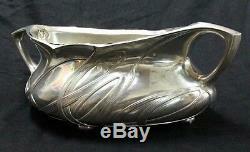 Lovely silver plated WMF inkwell with doves birds in nest egges 24 cm x 11 cm. 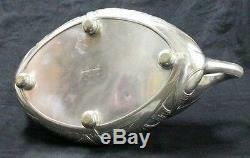 Nice antique WMF silverplate silver plated knife rest holder 18 cm x 15 cm. Antique Lovely tiny & small WMF silver plated basquet. Lovely antique WMF silverplate silver plated mirror with angel cherub at top. The item "Interesting antique Plata Lappas Argentine Centre Piece silver plated" is in sale since Thursday, October 23, 2014. This item is in the category "Antiques\Decorative Arts\Metalware". The seller is "thenepo" and is located in capital federal. This item can be shipped worldwide.